I was extremely pleased to receive many responses/solutions to the Ruby LinkedIn Sourcing Challenge I posted recently, including some from well-known online sourcing heavyweights, as well as a number from other talented folks who came out of the Internet ether from several continents to show off their skills and take a crack at solving the challenge. Kudos to those who successfully found people on LinkedIn who have experience with Ruby but do not make explicit mention of it on their profile! 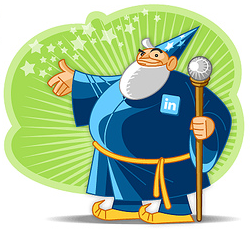 I sincerely hope everyone appreciated seeing the various approaches and methods people utilized to solve the first LinkedIn Sourcing Challenge – that was my primary motivator in posting it. One thing I noticed from some of the responses is that for a few people, the challenge seemed too easy. Have you ever noticed that when you X-Ray search LinkedIn targeting a specific metro area, some of your results are not actually of profiles of people who live in your targeted metro area? If you haven’t, let me show you. So how does this result turn up? 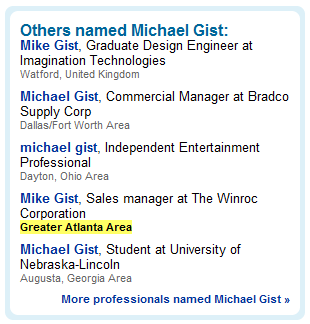 Location false positive results like these are returned because there are positive hits on the “standard” search terms (e.g., Java, J2ee, weblogic) from the LinkedIn profile itself, and a positive hit on “Greater Atlanta Area” in the section of “Find a different _____ _____” section of public search results. A bit of advice – before you try to whip through this challenge thinking you have it solved, be sure to thoroughly test your proposed solution. That means checking multiple pages of results to ensure no profiles of people who do not live in your target metro area have leaked in, as well as making sure your solution doesn’t accidentally or unnecessarily reduce the overall number of legitimate results of local profiles. If the number of results from your solution seems low for the types of people you’re looking for, your solution likely eliminated profiles you didn’t want to. Who can crack this challenge?